I’m not sure why it took me so long to get the hang of galettes, but I suspect that overthinking had a lot to do with it. Sometime back in June, I finally made a galette that I was happy with, and since then I’ve been making it with different combinations of summer fruit and different ratios of whole grain and regular flour. This vegan spelt plum galette might just be my favorite so far. For years I’ve read about how galette’s are “the lazy person’s pie,” especially lovable for their low-maintenance rolling and folding, etc. Except I just couldn’t get it right. The first time I tried making galette I filled the crust up before transferring it to a baking sheet, and I basically wrecked it when it came time to transfer. The next few times my proportion of filling to crust was always off (usually, there wasn’t enough crust to go around). In fact, I seemed to do a lot better with pies, even complicated ones with lattice crusts. The best explanation I came up with is that I do well with rules and precision. Cooking processes that call upon intuition are usually the ones that take me the longest to figure out, which is why I’m still dawdling with sourdough bread-making: I know that instinct is a part of the process, and that it’ll challenge my weaknesses, or insecurities, as a cook. Still, I’ve spent a lot of time this year getting more comfortable with the happy accidents that result from kitchen improvisation, and—more importantly—coming to terms with the fact that you only grow as a cook if you allow yourself to mess up. That’s the spirit that guided me as I made one more attempt at galettes this summer: I told myself that it was all just an experiment and it didn’t matter if it was a dud. After all, it wouldn’t be my first. Needless to say, that’s when things came together. Past experience suggested that I needed to make more crust than I’d seen some recipes call for, so I did. I remembered how hard it is to move the galette once it’s stuffed and folded, so I transferred my dough to a lined baking sheet after rolling and then filled it up. Instead of fretting about areas where the crust was too thin or didn’t reach as far over the filling as in other parts, I just folded and let the imperfections be. Then I baked the galette until it was a deep golden brown, the way I like it, even though it meant leaving it in the oven longer than many recipes seem to suggest. And in the end, I had a galette that I was pretty thrilled with. I tend to follow a traditional recipe closely until I’ve got at least one or two finished products I’m happy with; after that, I know I can modify confidently. Because I’m often veganizing a non-vegan recipe to begin with, I find that this is the easiest way to make a recipe my own while also using it for solid guidance as I get my footing, so to speak. The first time I made the galette I used my own favorite vegan pie crust recipe, which is a modification of Martha Stewart’s pâte brisée recipe, and I halved it. I used all-purpose flour, but once I had a few good results, I started trading a third of the flour for whole wheat pastry flour. Now I’m doing that with spelt flour instead, and I’m loving the slightly nutty flavor it adds. You can use all spelt, too, but if you do that I’d recommend using light spelt flour, or else your crust may be a bit dense and difficult to work with. If you try the galette, you can most definitely use any fruit you love, keeping in mind that really juicy fruits (like berries) may demand a touch more flour in the filling (I found this to be especially true of strawberries). You can add spices of choice to the filling if you like; when I make this with apples in the fall, I’m sure I’ll add cinnamon, nutmeg, etc. You can make the dough ahead of time and freeze it for an easy, impromptu galette, and if you double the dough recipe, you’ll have enough for pie. If you’re new to galettes or have had a hard time with them, the way I did, maybe follow this recipe closely for your first attempt. After that, though, you’ll probably have more delicious finished products if you take the time to make this whole process your own. To make the crust, mix the flours, sugar, and salt in a large mixing bowl. Add the butter and use a pastry cutter or two knives to cut the butter into the flour, until the pieces of butter you have in the mix are about the size of peas (alternately, you can put the flours, salt, and sugar into a food processor, add the butter, and pulse until the ingredients are combined and the butter is the size of peas). Mix the ice water and vinegar. Add the water into the flour mixture in a thin stream, using a spatula to mix as you go. As soon as the dough holds together without being wet or sticky, and it sticks together when you squeeze a small amount in your hand, it's ready. If your dough is too crumbly and isn't holding together, add additional ice water by the teaspoon until it does. Transfer the dough to a floured work surface and shape it into a disk. Wrap it in plastic wrap and refrigerate for at least 1 hour. At this point, you can keep the dough in the fridge for up to 2 days or freeze it for later use, if you like. When the dough has finished chilling, preheat your oven to 400F. Toss together the plums, sugar, salt, lemon, and flour. Flour a work surface and roll the dough into a circle that's about 12-14 inches across and 1/4 inch thick. Carefully transfer this circle to a parchment-lined baking sheet. Pile the plum mixture into the center of the galette, leaving about 1 1/2 inches of dough free all around the sides of the circle (you'll fold these over the filling). Don't worry about making any pretty patterns with the fruit, unless you'd like to. A rustic look is the goal! Fold the edges of the galette over the filling. You can be as casual or as neat as you want to be here, so long as the fruit gets tucked into the dough. If you like, whisk together the non-dairy milk and syrup, then brush the folded sides of the galette with the mixture and sprinkle them liberally with demerara sugar. Bake the galette for 40-50 minutes, or until the crust is a deep, golden brown and it's sturdy all the way around when you tap it (I recommend checking in on it at 35 minutes, just to see where you are). Allow the galette to set in a cool, dry place for at least a couple hours (3-4 is ideal) before slicing and serving. Top with vegan ice cream, whipped cream, or enjoy it the way it is! *You can also use 1 1/2 cups all-purpose flour, omitting the spelt, or you can substitute whole wheat or rye flour for the spelt. **You can also use 8 tablespoons coconut oil and increase the salt to 1/2 teaspoon, but I think vegan butter gives better results. The galette is lovely the way it is; a friend of mine pointed out that part of its charm is that you can pick a slice up as if it were pizza. (Pie feels like a bigger and messier commitment.) If you’d like to, you can serve the galette with vanilla ice cream, even piling a scoop or two into the center of the galette before you cut and share it. The galette will call upon your intuition at many points along the way, but once you try it a couple times, I think you’ll find, as I did, that it really is easy–and fun, too. And it’s especially easy if you make and chill the crust in advance. 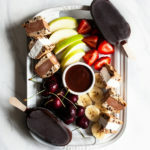 There’s plenty of summer fruit ahead of us, and while it’s all ripe and juicy I hope you’ll get a chance—if you’re so inclined—to make and share this tasty vegan dessert. Let me know if you have any questions! HI Gena!! This is beatuiful!! The photographs are stunning. Also, I love how you describe you process “mid-fold” that it doesn’t matter if all the folder borders are even. It sounds like you hit that point in your baking life where your eye and hands are telling you to trust them! Also as a person who has made a lot of baked goods, conventional, vegan and even gluten free, and even conventional pie crust back in the day (which I learned from my grandmother who had brothers that ran a bakery–I still have one of their pastry cloths–) you gave very good instructions. I think it’s great, too, that you picked a plum filling to showcase. 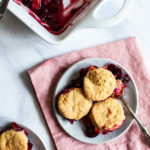 It isn’t as common as peach or apple, but baked plum desserts are heavenly and they turn such a beautiful color. Thank you! It was a pleasure from start to finish! Wow! This looks really good! And beautiful too!! Everyone of your recipes I tried comes out tasting so good…I own your Choosing Raw cookbook and love it! I wanted to try making this pie, but was wondering if I could use some type of gluten free flour instead of flour? Crossing my fingers for a yes answer to that! Haha, but if not I totally understand! Thanks for creating wonderful vegan recipes! My answer is that, if you have a gluten free, all-purpose blend that you know and trust, and you’ve used it in pastry before, go for it. I’m sure it’ll be fine. I haven’t made the galette with a GF flour blend yet, so I can’t 100% vouch for it, but many of the all purpose blends have gotten so good that you can safely use them in a 1-to-1 replacement. 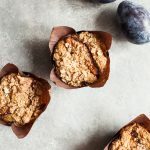 I’d recommend either a blend of your own, using flour and starch, or an all-purpose blend (rather than trying to use all oat flour, for example, or all rice — usually, having a flour/starch mix gives the best results). Let me know how it goes, and thanks for the kind words! Thank you for your advice! I really appreciate it! I’ll try making this soon and let you know how it comes out. Excited and nervous, but I won’t know until I try! This looks delicious! Love the color you achieved on the crust!! Love the idea of making and freezing the dough ahead of time – means you can whip it up quickly when the mood strikes! Instructions are really clear and the photos are beautiful, I can’t wait to try making this myself! I am 12, and this is one of my favorite recipes. I’ve made it with blueberries and plums, just blueberries, and apples. It is so good, and everyone who tries it loves it so much. The crust tastes best when you use the original flour combo, and really mix the butter in well (I always use regular butter). I think its the best baked good I’ve ever made. Just made this for some friends we had over for dinner and it was amazing. My mom had just given me a bunch of plums and this was the absolute perfect way to use them! I served it with coconut whipped cream and used brown sugar for all the granulated sugar. Thanks for the tasty recipe! One question, how is best to store the leftovers? Not sure if it should be refrigerated or not and how long it will last.